Doritos Tapatio Large Bag After many months of testing and research at Frito-Lay for a new formula to success for the Doritos brand in combination with the long time Mexican favorite, Sabritas, it decided to partner up with Tapatio Hot Sauce to combine its Salsa Picante formula with the best selling Nachos chips from one of America's most consumed snack brands. From our understanding, we have heard that even Tapatio's owner was heavily involved into the R&D process to make sure the hot sauce flavor was a perfect match to the original hot sauce. We've tried them, and absolutely love them. We highly recommend them to you. 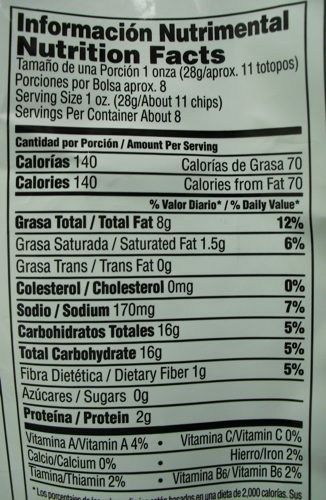 Ingredients: Whole corn, vegetable oil, spices, maltodextrin, cheddar cheese, salt, whey, monosodium glutamate, natural flavor, buttermilk, romano cheese, whey protein concentrate, onion power, sodium diacetate, corn oil, citric acid, disodium phosphate, corn sugar, artificial color, garlic powder, sugar, lactic acid, skim milk, disodium inosinate, disodium guanylate and sunflower oil. Doritos enchilados con Salsa Tapatio, Chilosa y Sabrosa. Una combinacion muy buena y genial. Los totopos de maíz con salsa Tapatio tienen un sabor genial y picoso. Doritos Tortilla Chips con Salsa Picante te hacen sudar pero con gusto que te picas para seguir y seguir. Cada dorito que te comes sabe mejor que el anterior. Doritos con el autentico picor Mexicano. Gracias Doritos y Tapatio por esta combinacion genial llena de sabor y picor. 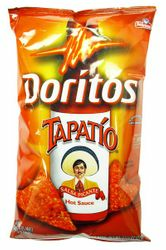 Dile HOLA a Doritos Tapatio y gracias Sabritas por darle el toque Mexicano a Doritos. Ingredientes: Maiz entero, aceite vegetal, especias maltodextrina de maiz, queso chedar, sal, suero de leche, glutamato monosodico, saborizante natural, suero de mantequilla, queso romano, concentrado de proteina de suero de leche, cebolla en polvo, diacetato de sodio, acido citrico, fosfato disodico, jarabe de maiz, colorantes artificiales, ajo en polvo, azucar, acido lactico, leche descremada, inosinato disodico, guanilato disodico y aceite de girasol. Great level of heat, best taste of any style out there. Please don't discontinue!! Nacho Doritos with the more you eat, the more heat! Excellent product! These are my favorite Doritos ever! ConsI wish they were sold locally because I can't afford to buy them as often as I would like. I have ordered this several times already and are a great item. Love this product just not the shipping price..For us servicemen overseas !!! Me and my fellow servicemen love this product we order them in LARGE amounts..Usually 15 bags per order...It is just the cost of the shipping which kills us!! But what can we do?? We need our mexican products...Entonces..ORALE !! ProsPerfect tast and just great !! ConsNothing except the shipping cost !! 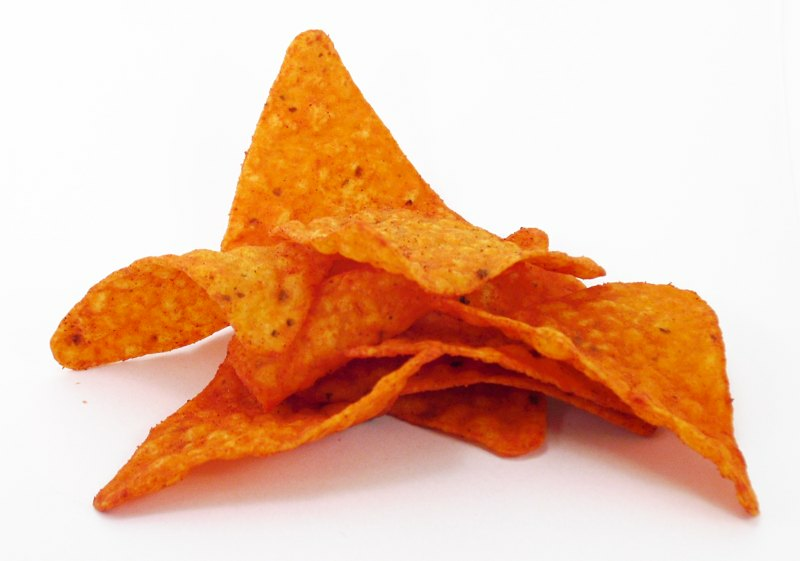 A few years ago, Doritos came out with a limited run of 'Sizzlin' Picante' chips. They were very hot and very tasty, the best I'd ever had, and then they got rid of them. Years later, they finally made these; Tapatio Salsa Picante Doritos. These are even better than the Sizzlin' Picante flavor of the mid-'00s. This will be my chip of choice for the foreseeable future. I just hope Doritos starts stocking them more on the East coast; I was lucky to discover these in a limited order in a local Wal-Mart back in September, and have had to order them online ever since. I have been a Dorito fan for decades. I heard about this product but could not get it in my region of the U.S. I found out about Mexgrocer from a Yahoo Answers answer saying where you can buy them. These Doritos are great! Also really good coverage of cheese and spice on each chip. You know how you get that really cheesy one in a regular Doritos bag? Well, every chip was just like that. And it was not a fluke because I purchased 4 bags (and ate them in almost as many days)! tapatio doritos are awesome! 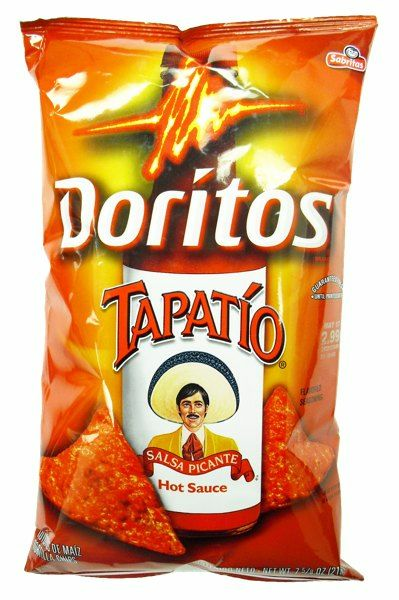 great dorito taste, great tapatio flavor-- you will enjoy the spicy kick! yummy! The chips aren't bad but don't really have the Tapatio flavor. I can already see this being my new favorite Doritos flavor. The Tapatio chile pepper hot sauce powder it has resembles that of the hot sauce, but with a much better and long lasting after taste. It's spicy but not as burning as Takis or the Flamin Hot flavors. This is going to be a hit in our household for many years to come. Kudos to Doritos for such a great introduction.